In 1986, Mkele Mbembe was on holiday in Kenya after graduating from Northwestern University. On a hike through the bush, he came across a young bull elephant standing with one leg raised in the air. The elephant seemed distressed, so Mbembe approached it very carefully. He got down on one knee and inspected the elephant's foot, and found a large piece of wood deeply embedded in it. As carefully and as gently as he could, Mbembe worked the wood out with his hunting knife, after which the elephant gingerly put down its foot. Twenty years later, Mbemb was walking through the Chicago Zoo with his teenage son. As they approached the elephant enclosure, one of the creatures turned and walked over to near where Mbembe and his son Tapu were standing. The large bull elephant stared at Mbembe, lifted its front foot off the ground, then put it down. 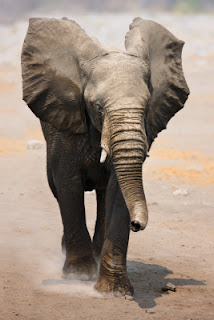 The elephant did that several times then trumpeted loudly, all the while staring at the man. Remembering the encounter in 1986, Mbembe couldn't help but wonder if this was the same elephant he had cared for those many years earlier. Mbembe summoned up his courage, climbed over the railing and made his way into the enclosure. He slowly walked right up to the elephant and stared back in wonder.